With all that said, there’s no denying the coolness of a bike like the Bobber. It’s the type of bike you can see yourself riding, whether you currently ride a 250cc commuter, an enduro/dual sport machine or a sportsbike. It inspires the inner James Dean we all (think we) have inside us, to come out and play. 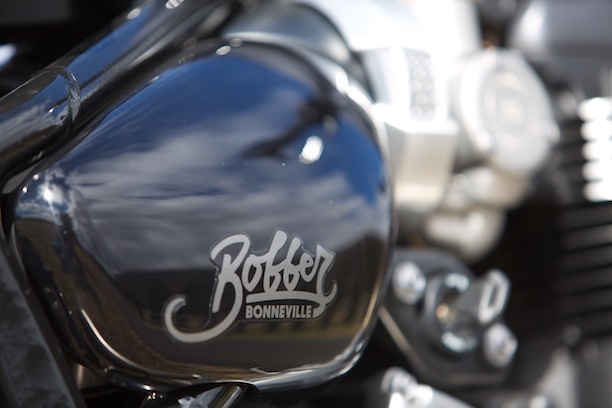 Laced wheels, a classic tank, fork gaiters, the engine finning and the tractor-style saddle make the Bobber really stand out from other machines available today – it’s very unusual and for a derivative machine – it’s heavily based on other Bonnevilles. The bike is physically quite small and low, so the 18-inch front wheel looks taller and the simple colour schemes are timeless. Nice carbs… Oh wait, they’re fake! There is Bonneville history here, re-interpreted. 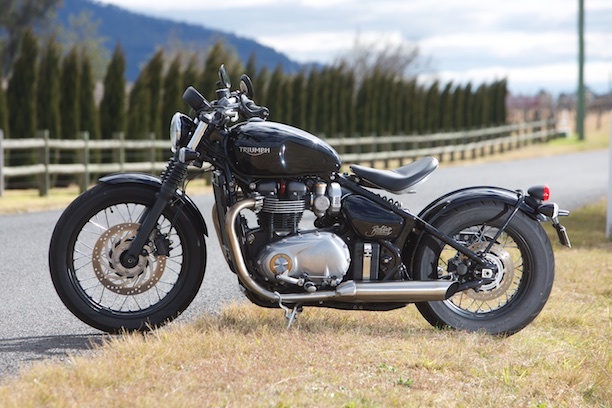 I think we find ourselves in this weird crossover period, and the Bonneville Bobber is a good example of that. In this period we’re not really thinking new, we’re re-imagining the old instead, bringing it to life with what we currently know, and seeing if something better comes from it. 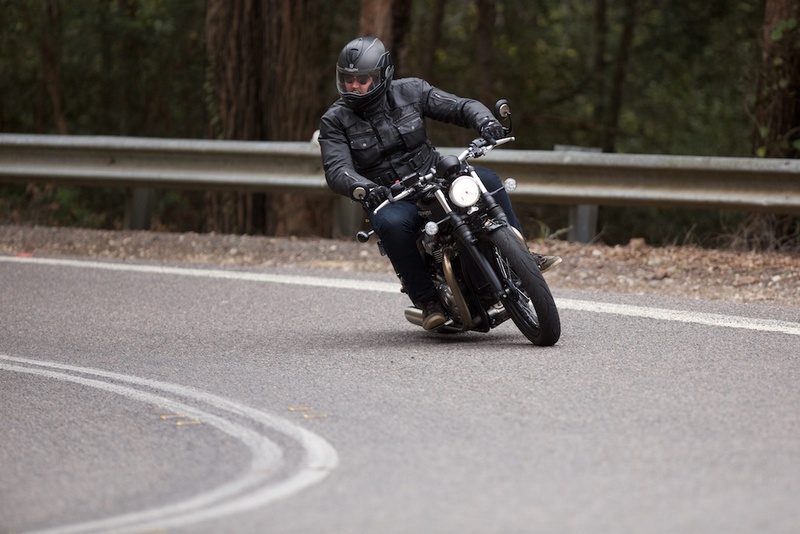 Minimalist: engine, wheels, frame and handlebars is about all you’ll need on a Bobber. There was a lot about the bobber that worked back in the day. They were made cheaply from old wrecks and they were built with the soul purpose of winning traffic-light GPs. This still works for custom bike builders nowadays, but the lack of a rear shock obviously doesn’t work for regular folk like you and me. 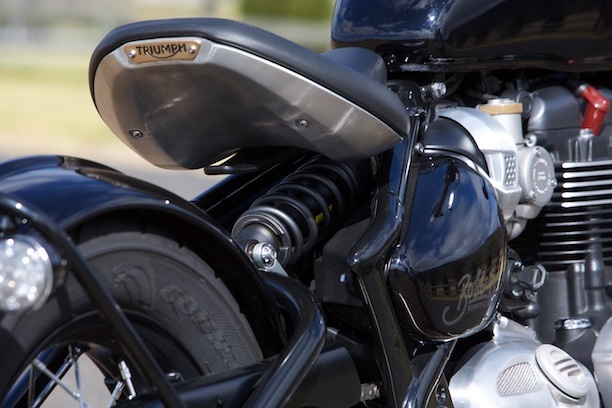 Triumph has had to come up with creative solutions designing the bike. Thankfully there is a rear shock, but it’s (not completely) hidden. This would have taken Triumph engineers plenty of time to figure out and get right. Half of the rear section frame is missing, the half which normally mounts the Bonneville’s twin rear shocks! Other points of note are the bespoke aluminium adjustable rear seat and rear-wheel-hugging fender. The seat unit, with hidden rear shock is beautiful. The rest of it you’d say is simple enough, and that’s to make things look traditional. 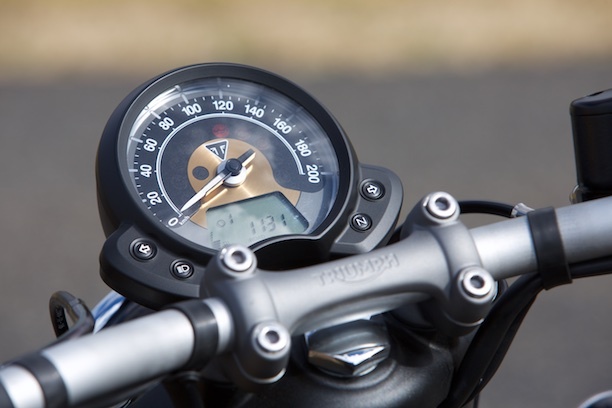 The single instrument cluster is a mix of analogue and digital, there are spoked steel wheels and a single disc up-front. What else do you need? Simple instruments contain a simple electronics interface. 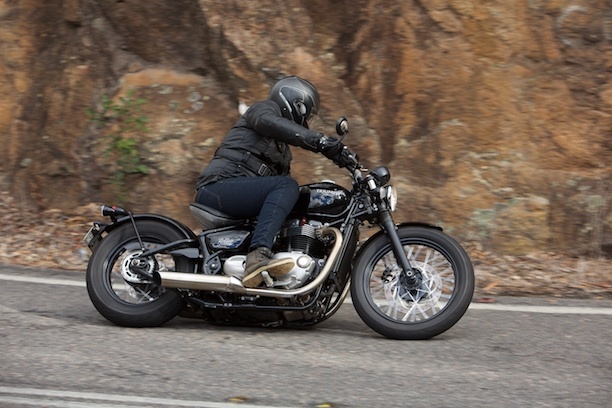 The other part is making sure it’s still capable of winning one or two of those GPs… So Triumph has thrown the bigger T120 Bonneville donk into the Bobber whilst giving the engine a torque-biassed tune. The engine is a liquid cooled jobbie with an electronic fuel injection system styled to look like AMAL carbs. Modern bobber thinking (if it’s not needed, get rid of it) goes out the window at this point, but as a whole it looks right, so it works. A modern electronics package means it’s not too much trouble to add rider modes (Road and Rain modes), and we also get a simple suite of electronics like a ride-by-wire throttle, switchable traction control and ABS (both on/off) on this very retro machine. What you won’t see are things like an up/down quickshifter and six-axis inertial measurement unit, so it doesn’t have the level of electronics we see being given to sportsbikes nowadays. It doesn’t need them. Apart from the style, the engine and steering geometry are Triumph’s biggest real-world assets with the Bonneville Bobber. 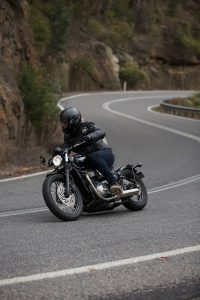 The front end is confidence inspiring, a conservative steering angle and 18-inch front wheel provides enough of that ‘cruiser’ feeling without the vagueness that can sometimes plague bikes built to go straight. A longer wheelbase provides lots of stability too. While it’s certainly no twisty eater, you’ll enjoy manhandling the wide ‘bars once you get a feel for the Bobber’s sure-footedness. While engine is so good you’ll want to ride it fast, the steering is so good you’ll want to ride it fast everywhere. But if you continually ride it fast you’ll start running into a few problems. The biggest one in my books is how it stops. 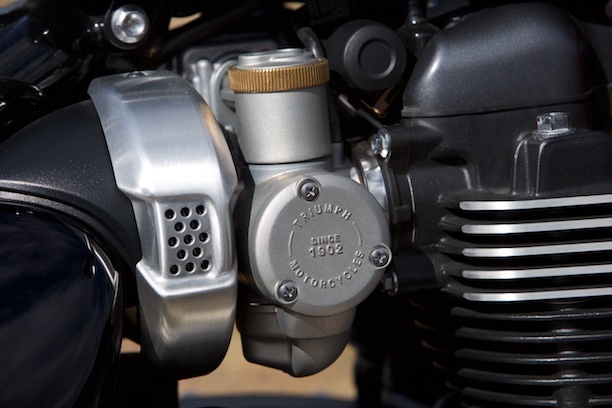 Triumph has kept things very authentic by opting for a single disc and two-piston caliper at the front. While it carries the bike’s aesthetic, it’s quite spongy and requires more effort than it should to pull the bike up. It would have been nice to see more stopping power provided: by either a twin disc front end use on the T120 Bonnie, or a single four-piston caliper at the very least. The same goes for the suspension which is another area where the Bobber can be improved. There’s not much travel, or provisions for adjustment for that matter. This will suit an 70-90kg rider well enough, but if you sit at either end it’ll be a rough ride and can tend to beat you up on rough roads. Lastly, there is cornering clearance, or should I say, a lack of cornering clearance. It steers so well you’ll want more of it! Punt the Bobber through your favourite set of bends and the pegs will scrape without lots of effort, without going near the edge of the rear tyre. This is the toughest problem to solve and I think Triumph’s engineers were always going to be up against it when designing a very low and long bike that also happens to perform well. Riders could possibly get more out of it with smaller aftermarket pegs, but it won’t make a tremendous difference. After a few weeks with the Bobber on a mix of city streets and winding roads I reckon it’s a bike that everyone can appreciate but only a few could really love. And that’s totally fine. 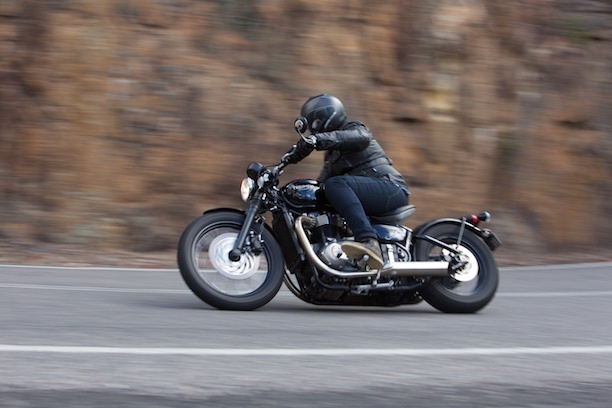 What the Bobber will do however, is get you off your arse and into the showroom, through sheer desire alone. If you like the look of it, you just have to ride one and experience it for yourself. 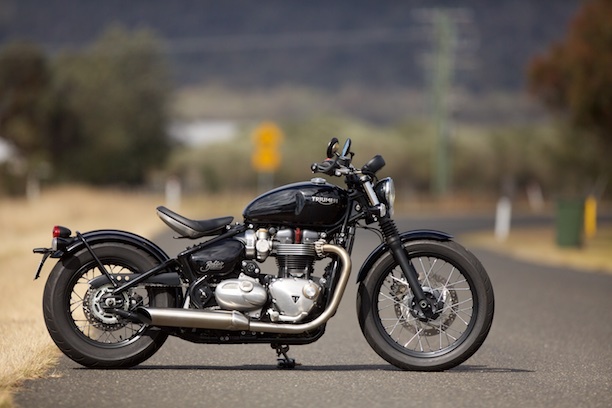 Triumph deserves praise because they haven’t just built the Bobber on the cheap. It’s well thought out, very well executed and for the most part, it works. 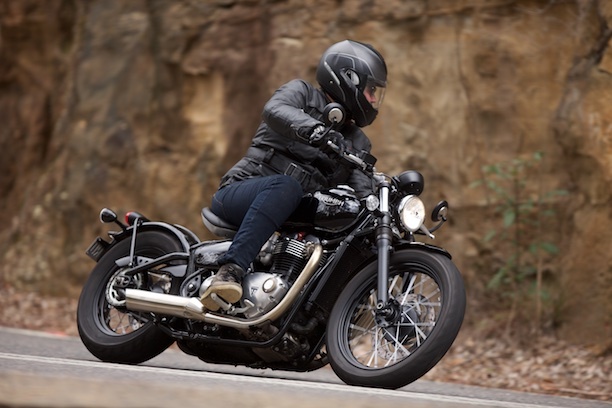 While it may not be everyone’s cup of tea, building the Bobber may well be a win, win for Triumph. For everyone who buys one, there’ll be many more walk into the showroom with the same intention, and possibly end up bringing another Bonnie home instead.